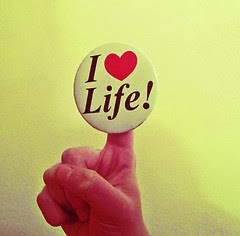 If you're doing something you love, by the end of the day you may be physically tired but spiritually energized. If you spend the day doing things you don't care for, you may be physically fine but feel spiritually low ... passion is about what feeds your spiritual energy rather than consumes it. When I read this section I felt that Sir Ken was spot on! I'm in a job that is extremely demanding, yet I find it energizing. When considering why I love my current job, I was brought back again to Dan Pink's statements about autonomy, mastery and purpose. Some years ago, over a long weekend, I drove with some colleagues to Munich International School for a workshop being run by Dan Pink and Jason Ohler. I found it inspirational because after this I started to question what motivated me - which then led me to question what I found unsatisfying about the job I was actually doing. I discovered that it was very important for me to be self-directed and that being overly managed led to me feeling disengaged. I also came to realize that what I needed was to have a purpose and feel like I was making a difference. Since both of these things did not exist in my previous job, it was really only a matter of time before I was going to move on, however one of the best things I did in my last year at the school was to get involved in a professional reading group that discussed Alfie Kohn's book Punished by Rewards, which also dealt with motivation. In this book Kohn questioned why people become burnt out and bitter and the conclusion he came to was that it was nothing to do with how much work they do, but because of a feeling of powerlessness: lacking the freedom to decide what to do and how to do it, and lacking a sense of control over one's own work and ideas, which is a real killer to creativity. In my current job, one of the things I love is being part of the R&D Core Team, as well as working on several R&D task forces, which are effecting positive changes throughout ASB. When I think about all the initiatives that teachers are involved in, all the changes they are making as educators, it's amazing to me that their level of stress seems very low compared to other places where I have worked. This is probably because of the culture of being involved, of actually participating in the decision making, which as Kohn notes has a positive effect on both productivity and job satisfaction. Over the holidays I did read a huge number of blog posts (it was great to have the time to catch up!) and one that caught my attention this week was by Doug Belshaw writing about influence and attention. At my old school when I was feeling depressed about how little I seemed to be able to accomplish, I was given good advice by a friend which was to concentrate on the things that it was possible to control - and to change the things that it was possible to change. For example an individual teacher may not have any control over what is taught, but s/he can certainly control how it is taught. 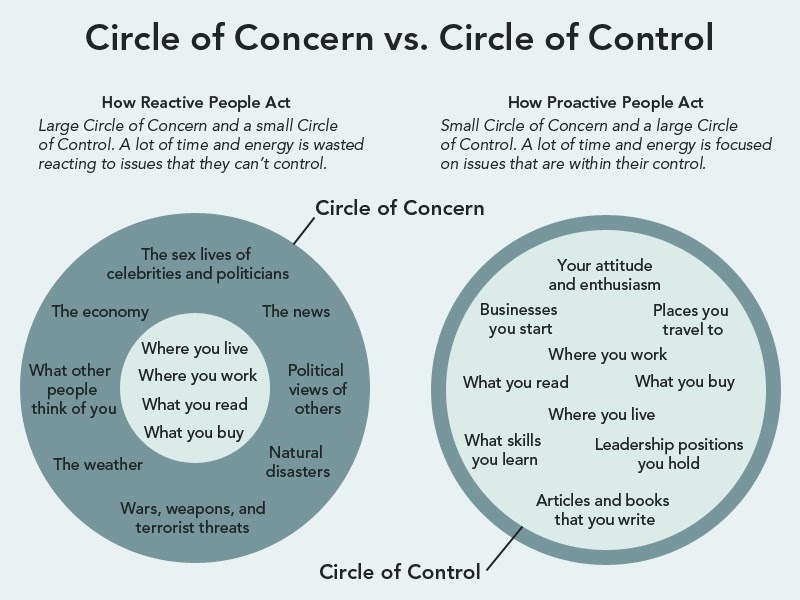 In his blog post, Doug used the diagram below about the Circle of Concern vs the Circle of Control. Clicking on the link to the blog post he refers to by James Clear, it seems that this diagram is based on Stephen Covey's work on influential people. James Clear writes: "Notice that by eliminating or reducing your Circle of Concern, you have more time and energy to put towards your Circle of Control. That means you have more mental space to use for creating art, starting a business, having meaningful conversations, or otherwise contributing to the world around you." I've started to think about how much of my attention is spent on things I can't control and whether I can reduce this even more. Since I don't have a TV and don't often read magazines I know almost nothing about celebrities - in fact I'd be hard pushed to recognize many of these in photos as I just don't care at all about their lives. I read the news online which means I choose which areas of the world I want to focus on and which stories I want to read. I usually look at the UK headlines, though rarely read the stories, and also look at the European and Asian pages on the BBC. I don't think much about wars or about the weather or care much about what people think of me. I would say that over the past couple of years I have come to spend much more of my time in my Circle of Control, which has made me a more productive person. I have chosen what work to do, where to work and where to live. 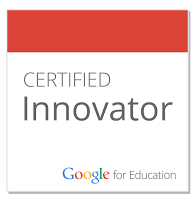 I feel in control of my own professional growth, taking MOOCs and online courses that interest me, without any intention of having them add up into any sort of qualification, and interacting with educators around the world whose ideas and experiences I find interesting. I read and blog about the things that I'm thinking about, and I have the time to think and to read and to write simply because I am spending most of my attention on the things that I can control. Hopefully these past 18 months have seen me change from a reactive person into a much more proactive one - spending more time doing the things that I love.